Washington (CNN) - President Barack Obama said Monday that the United States will resume using military commissions to prosecute alleged terrorists held at the Guantanamo Bay, Cuba, detention facility. The announcement said the Obama administration remains committed to closing the controversial detention facility, but will rescind its previous suspension on bringing new charges before military commissions. Obama is an IDIOT. He is quickly waking up and becoming George Bush. He should never have closed them in the first place. 9/11 was a inside job and they are using gitmo and military commissions to go around the bill of rights and the constitution. I thought we voted against the Bush policies regarding gitmo, coporate wellfare, middle east wars, etc. New president same failed policies. Doesnt matter who you vote for democrats or republicans they are both paid by the smae people (corporate special interests). Finally he is starting to be an american president. 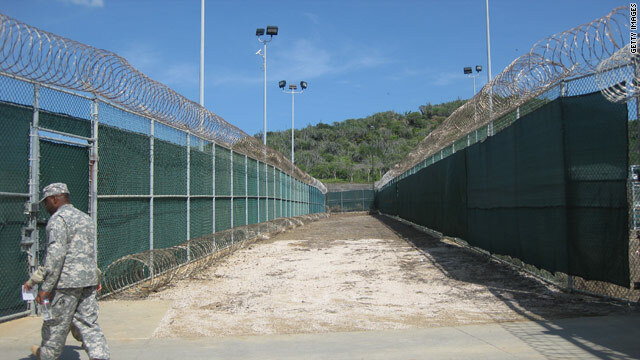 First the surge in Afghanistan and now realizing the people in gitmo are dangerous. Can we get a third good move in the last half of this term. About Face! backward March. At least I wasn't stupid enough to believe him in the first place. Wait until the trial for Obama begins....that is going to be good! It's only a matter of time. Since Obama is unable to get his military and DOJ to obey their orders, he seeks expediency, ignoring our laws and constitution. EXCELLENT JOB, SIR! What NEXT? Repeal of the ENTIRE constitution for the POPULACE? I think this is a good lesson for the American people to have a more thorough understanding of how the government works and the legality that both protects and slows down progress. However, we should consider the alternative. Maybe it is taking Obama a long time to close Guantanamo because of these legal hurtles but isn't it better than having a dictator who can take away our basic rights. I'll take bureaucracy to protect our rights over expediency for the sake of progress any day of the week no matter how annoying it is. whaa,, wait a minute while I get up and dust off yet anotherset of backtracks off my backside. When will the learn 1600 Pennsylvania is no p[lace for rank amateurs! Next thing you know we will invade Libya and Obama will break the record by having 3 on going wars in his presidency.